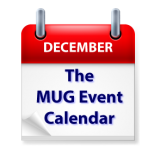 The MUG Event Calendar for the Week of December 21: El Capitan, iTunes 12 and Merry Christmas! As one might expect, this week’s MUG Event Calendar slows but doesn’t stop as we approach the long holiday weekend. A Canadian group will talk about a potpourri of subjects including iTunes 12, and a California group will dive deep into El Capitain. From The MUG Center to Apple User Groups everywhere, have a terrific holiday, no matter what holiday you celebrate.